Do Restaurants Have to Pay Minimum Wage? With the recent raise to the minimum wage in several states following the 2016 election, there has been some confusion about who gets paid what, when it comes to restaurant workers. Some restaurant employees are tipped, but in some states tipped workers now received a flat minimum wage. In other states, the tipped wage has gone up but is still less than the flat minimum wage. And then there is the question of employer theft of wages and tips (intentional and unintentional), taxes on tipped wages and rules around claiming tips. Finally, the age of old question that has divided politicians in Washington for years: Does the minimum wage hurt or help restaurants and their employees? The federal minimum wage was established in 1938 by President Franklin Delano Roosevelt, as part of his New Deal. The goal of the federal minimum wage, which was originally 25 cents an hour, was to ensure that workers were paid a livable wage (one that would keep them out of poverty). Along with the establishment of a minimum wage, overtime pay was also introduced at the same time, as part of the Fair Labors Standards Act, ensuring that employees who worked more than 40 hours a week were paid time and half, for certain jobs.Minimum wage is adjusted every few years by Congress. However, the current minimum wage of $7.25/hour has not kept pace with inflation or a livable wage. Had the minimum wage been increased to reflect the cost of living and general inflation it would be around $11 an hour today. It means that in 1938 the average person making minimum wage could support themselves and their family while remaining out of poverty. Today, a worker who makes minimum wage earns annually $15,080 (assuming that he or she works five days a week, 52 weeks a year without missing a day or taking a day without pay). The poverty line for a family of two (such as a parent and a child) is $16,078. Part of the confusion about minimum and restaurant employees is understanding who gets a tipped wage and who gets the minimum wage (or higher) hourly rate. Just to give a little background, tipping as a means of income was established in 1942, when the Supreme Court affirmed that any tips given to employees are the sole property of that employee; their employer or manager could not claim that money for the business. In 1965 tips become taxable by the individual and in 1988 Restaurants were required by law to pay their own share of FICA taxes on the total reported tip income of their wait staff. In 2012, mandatory tip pooling with back of the house employees was prohibited under a revision to the Fair Labor Standards Act. By law, everyone who works in a restaurant, no matter the state should be paid a minimum of $7.25 an hour. 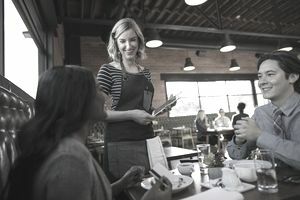 Depending on the local state minimum wage laws, restaurant servers can be paid what is known as a ‘tipped wage.’ The federal tipped wage is $2.13 an hour, with the provision that if a tipped wage employee does make the federal minimum wage of $7.25 an hour per shift (not per week) the employer is to make up the difference (known as the minimum cash wage). So, if you were a restaurant server who worked an 8 shift during a snow storm and there were only a couple of tables, your tips might only be $10. That equates to $1.25 an hour. Your employer needs to pay you six dollar/hour difference to ensure that your hourly rate meets the federal minimum wage. One of the biggest areas of confusion around minimum wage is the tips that servers and bartenders receive. According to the US Department of Labor, a tip is the sole property of the employee. It is true of any employee in any industry, from restaurants to taxi drivers to hairdressers. You can in theory tip your doctor if you wanted, and that money is his or hers to keep unless their employer has a written policy about not accepting tips. Recent raises to minimum wage in different states have resulted in different wage rates for tipped employees. For example, in Colorado, restaurant servers minimum cash wage (aka) tipped wage is now $6.28 an hour. In Idaho, the minimum cash wage is 3.35 an hour. In Alaska and California, there is no tipped wage; servers are paid the regular minimum wage of $9.8 and $10 respectively. Getting rid of the tipped minimum wage, as they have done in Alaska and California might look good on paper. After all, who can get by on $2.13 an hour? But many restaurant workers in states with a raised tipped wage or a flat minimum wage make less overall than they did under the $2.13 an hour. It happened in Maine, where a recent rise in the minimum wage to $9 and the tipped min. wage to $5, has seen some areas decline in tips. According to a server in an article by Maine Public Radio, her tips have gone in part because customers think she is making a much higher hourly wage than she really is. It’s also important to note that the cost of living and median wages vary from place to place. For example, in New York, where the tipped minimum was is $9 still falls short of the minimum needed for the local living wage of living in the Big Apple, which is estimated to be $14.52 an hour. In contrast, the state of Washington is noted for having one of the lowest costs of living, meaning that it’s minimum of wage $9.42 an hour goes a lot further for restaurant employees. Does the Increase Hurt Restaurants? Proponents of raising the minimum wage, including groups like Fight for 15 and the Restaurant Opportunities Centers United point out that the current minimum wage is not a livable wage. For the restaurant industry, in particular, low wages are often coupled with a lack of affordable health insurance and no other benefits like retirement matches, health savings accounts. The low wages also disproportionally affect women and minorities — the restaurant industry’s largest employee demographics. No matter if you are pro-minimum wage increase or against it, as a restaurant owner or manager it is important you know all the rules and regulations around wages for your state. It is also good business sense to pay workers more than minimum wage, to keep turnover low and improve customer service. There is no one-size-fits-all to this dilemma. Wages and cost of living vary widely from state to state. A restaurant owner needs to what is best for his or her business ​and its employees.